It is a health supplement for people of all professions: Office workers are often working in a poor environment, required to remain in a fixed posture for a long period of time and lack of excercise. Tha does nothing to help our body in blood circulation. For long time without proper care, it could cause many health conditions. Multi Ginseng Tablets New Formula helps preventing the modern office syndrome. Directions for Use One time daily after breakfast. 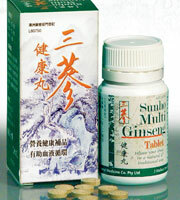 ADULT: Take 2 tablets CHILDREN: Take 1/2 - 1 tablet Sunho Multi Ginseng Tablet (New Formula) is manufactured in Australia. Under the strict guidelines of Australian code of GMP for medicinal products. It is listed with the Australian health regulator, Therapeutic Goods Administration. TGA Approved No. AUST L 142128.